Inverleigh Mechanics' Institute. Officially opened on Tuesday 27 March 1866. The Mechanics' Institute movement began in British urban industrial centres in the early 1800s. A "mechanic" was a person applying skills and technology. During the 19th century, most towns in Victoria established a Mechanics' Institute or Athenaeum with a library and meeting hall. Common objects were the "spread of useful knowledge" and provision for "rational recreation" in the community. 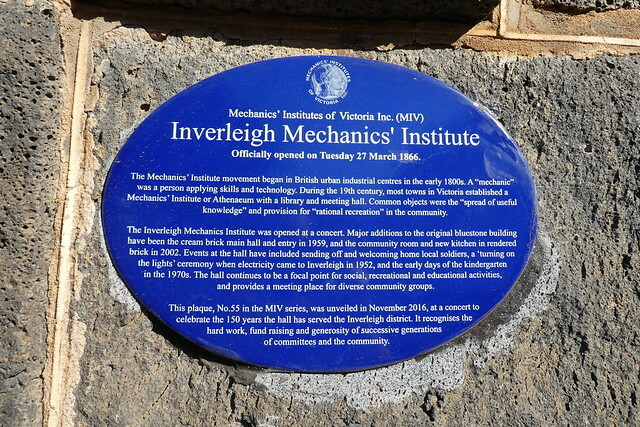 The Inverleigh Mechanics' Institute was opened at a concert. 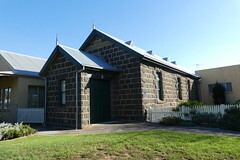 Major additions to the original bluestone building have been the cream brick main hall and entry in 1959, the community room and new kitchen in rendered brick in 2002. Events at the hall have included sending off and welcoming home local soldiers, a 'turning on the lights' ceremony when electricity came to Inverleigh in 1952, and the early days of the kindergarten in the 1970s. The hall continues to be a focal point for social, recreational and educational activities, and provides a meeting place for diverse community groups. This plaque, No. 55 in the MIV series, was unveiled in November 2016, at a concert to celebrate the 150 years the hall has served the Inverleigh district. It recognises the hard work, fund raising and generosity of successive generations of committees and the community.